This little church is almost entirely early English, dating from the first part of the 13th century, although undoubtedly it stands on far more ancient foundations. This is testified to by traces of Norman and Saxon work incorporated into the building and in particular the Saxon font, hewn by hand from a solid block of Bracklesham stone, one of the oldest in the country. The black oak benches and beams are of early 15th century. The benches are of pre-Reformation date, but modern solid backs have been substituted for the original open back rails. The communion rails are pure 17th century Jacobean. The pulpit is also Jacobean and is interesting in that it was made by a former rector out of an old oak chest, the modern carved head under the bookrest being added later to hide the keyhole. The Yew tree in the churchyard, many hundreds of years old, had a narrow escape in 1945 when workmen, sent to lop a large branch which was damaging the roof of the church, misunderstood the order and began to cut the whole tree down. A local farmer saw this and notified the rector who was just in time to avert the tragedy, as may be seen by inspection of the bole. The Shepherds Church is to the south of the village on the northern slope of Didling Hill along a short track off Bugshill Lane. It is known for it's simplicity and the fact that it has survived the intervening centuries with very little restoration. The restoration work that has taken place has been very sympathetic. There is no electric lighting and the church is wholly lit by candles. 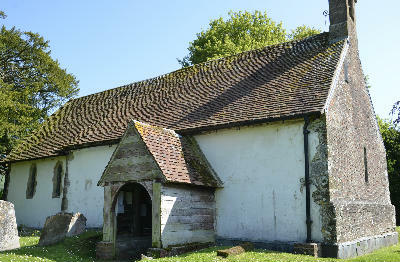 The one door to the church is north facing and the single bell, is said to be dated 1587.